Six would-be astronauts will this week begin a 520-day mock space voyage to simulate a mission to Mars. How will they cope with the huge psychological pressures? Deep in outer space, millions of miles from civilisation, they say no-one can hear you scream. The same may not be true of a warehouse in Moscow's suburbs. But here an audacious experiment is about to try to replicate the cramped, claustrophobic conditions of a voyage across the Solar System. From 3 June, the Mars 500 project will send a "crew" of six on a simulated 520-day round trip to the Red Planet and back. The cosmonauts - three Russians, a Chinese, a Frenchman and an Italian - will live and work as interplanetary travellers, spending eight hours a day working on maintenance and scientific experiments, eight hours at leisure and eight hours sleeping. Organisers at the European Space Agency and Russia's Institute of Biomedical Problems hope that the project will offer an insight into how such a mission would function. But above all, the most significant assessment they will make will be how it affects the subjects psychologically. Any communication between the crew and mission control will be subject to 20-minute delay to simulate the time it would take for signals to reach Earth. Meanwhile, cameras will monitor them 24 hours a day. With no access to telephones, internet or natural light, breathing only recycled air and showering once every 10 days, the men are certain to have both their individual mental states and group dynamics tested to the limits in the 550-cubic-metre simulator. The ultimate aim is to prepare for and support a successful mission to Mars, which will return with the whole crew in good, stable psychological and emotional health. Looking to analogous situations, the isolation environments of Antarctic research bases and submariners suggest the top two psychiatric diagnoses are anxiety reactions and depression. Preparations therefore need to include capacity to diagnose and manage these conditions as well as considering other rarer, but potentially more dangerous, psychiatric conditions such as an acute psychotic episode. Through appropriate selection, training and in-flight support it is likely the majority of crew members in both Mars 500 and any real mission will cope with the array of psychological challenges they face without any undue effects on themselves, other crew or the mission. The scenario is one that already has deep resonance in popular culture. Stanley Kubrick's 2001: A Space Odyssey, Andrei Tarkovsky's Solaris, Duncan Jones's 2009 award-winning sci-fi film Moon and, of course, A Space Oddity, the breakthrough single by Jones's father David Bowie, all use the device of space travel to explore themes of alienation and loneliness. But if art offers an ominous foretelling of the experiment, the scientists running it are confident that real life will be different. Patrik Sundblad, head of life science at the Esa's European Space Research and Technology Centre, says each of the crew members have been subject to careful vetting to ensure that all are both psychologically robust and motivated enough to cope with their mission. He also believes that the information it will generate will be of crucial importance not just to any future Mars voyage, but to the broader understanding of human psychology. "The real value of this project is that we can obtain data that would be very difficult to obtain any other way," he says. "We can monitor them 24/7 - that's very difficult to do in any other setting. "We can learn a lot about group dynamics and work out how to counteract any changes if they are not positive." Few would doubt that the conditions will put the crew under enormous pressure - not least given that one of the Russians, Alexei Sitev, 38, was married only four weeks before beginning the mock voyage. And while Esa insisted that team spirit remained high during an earlier, 105-day simulation, the length of the mission means that the cosmonauts will be metaphorically flying into uncharted territory. Prof Paddy O'Donnell, a social psychologist at Glasgow University, is intrigued by the experiment, having studied earlier research into the effects on individual and group psychology of space travel. He says the most significant point may come around six to eight months into the mission when, studies of submariners and Antarctic research teams have suggested, any tensions are most likely to begin to flare. The biggest dangers, he says, are boredom; crew members forging emotional bonds, positive and negative, which undermine their professionalism; and, worst of all, the group sub-dividing into social cliques. The way to get round all this this, he says, is clear leadership, explicit divisions of labour and very strict routines. "Routines and habits are very calming," he adds. "You don't have to think all that much." Prof O'Donnell acknowledges that separation from loved ones will be a huge psychological challenge for the cosmonauts. But he believes two factors will count in their favour. One is that the crew members are scientists, who "tend to be relatively introverted and low on neuroticism - these are practical people and you'd expect them to work together". Another is that they know they are on camera. "When you're visible, you're more likely to follow the rules," he adds. What the six will not experience, however, is the impact of weightlessness or, indeed, the terror and euphoria that comes with real-life space travel. "Astronauts usually experience a great deal of stress on take-off," he says. "But after a few days - once they've gone round the Moon, as it were - they report an enhanced sense of individual well-being and morale. "They also tend to report a transcendental experience that comes from being in space and looking down on the planet - obviously, this experiment can't allow for that." What is more, the fact that the mission is simulated is likely to have an effect of its own. Dr Maggie Aderin-Pocock, a space scientist with the satellite manufacturer EADS Astrium and a strong advocate of a manned mission to Mars, believes that the experiment will be extremely valuable - but expects that the main difference between a real and simulated voyage will be the difficulty for the crew in maintaining motivation. "I think the main challenge for them will be trying to maintain motivation for a long period of time," she says. "It's far less likely this would be a problem if you really were going to Mars. But the danger is that because you know you're really in a hangar in Moscow, you start thinking: 'I can't be bothered'." Nonetheless, the crew members will know that, if a mission to the Red Planet ever does take place, they will have played a significant part in it. And that alone may be enough to get them through all 520 days. Below is a selection of comments. Make it like a shed, men would survive for years. If humankind is to survive and thrive, then sooner or later - preferably sooner - we will have to adapt to life in space. Whether you believe our current civilisation is 20,000 years old or two years old, unplanned change happens all the time and we have too many eggs in this one basket. 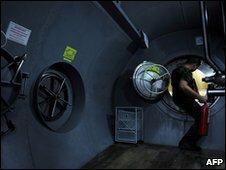 A far more realistic and practical experiment would be to send a real crew on a real mission for 520 days exploring below the oceans. That would replicate more precisely the real life conditions for astronauts as well as providing useful scientific data. Good luck to the crew, and everyone involved in the experiment. I can't imagine the determination required... but the value to any possible Mars mission must be immense. I hope it works out well for the whole team. The conditions in a real journey to Mars would be so different emotionally and physically that it is highly unlikely that the results of this "experiment" will be of any real value. I predict the experiment being aborted prematurely and/or at least one of the crew ending up in a hospital or dead. 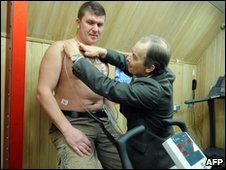 If any of the group develop an unexpected serious physical condition during the experiment will it be dealt with as if they were in space or will they be allowed to leave to seek medical attention? The test subjects/scientists are truly devoting a large portion of their life helping to further our quest for interplanetary exploration, for which great respect from people like me is deserved. Good luck to them and fingers crossed that we can function for 520 days without too many problems! This is bizarre. The experiment will simply demonstrate the effects on the group dynamics of six individuals who are acutely aware that they've signed up to live in a glorified Wendy house for 520 days. Why not trick the volunteers into believing they really are travelling to Mars and back? To the naysayers - of course it isn't a perfect simulation of a real trip, but surely this will be better than no trial run at all? This would make a good reality TV show, if only they were English-speaking degenerates with a tremendous sense of entitlement. A study like this will be important, yet is there the political and economic will from the countries to send a man to Mars? As per science fiction, humans should have made significant advances in space travel by now. However comparatively we have achieved very little.